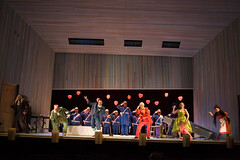 French set designer Christian Fenouillat made his Royal Opera debut in 2000 creating set designs for La Cenerentola, directed by Moshe Leiser and Patrice Caurier. He has has since returned to work on Madama Butterfly, Hamlet, Il turco in Italia, Il barbiere di Siviglia, Hansel and Gretel and Maria Stuarda, all directed by Leiser and Caurier. Fenouillat was born in Périgueux. He trained initially as an architect and since 1975 has worked as a set designer for cinema, theatre and opera. His other work for Leiser and Caurier includes Giovanna d’Arco (La Scala, Milan), Armide and La clemenza di Tito (Théâtre des Champs-Elysées), Wozzeck, Der Rosenkavalier and Der Ring des Nibelungen (Geneva), Jenůfa (Spoleto Festival), Aufstieg und Fall der Stadt Mahagonny (Lausanne), Ariane et Barbe-bleue and Lucia di Lammermoor (Opéra de Lyon), Giulio Cesare in Egitto and Norma (Salzburg Festival), Carmen and Fidelio (Welsh National Opera), Falstaff (Angers-Nantes Opéra), Rossini’s Otello (Vlaamse Opera), Die Zauberflöte (Vienna State Opera) and Le Comte Ory (Theater an der Wien). Other opera credits include an award-winning production of Pelléas et Mélisande (Brussels). In theatre, Fenouillat’s credits include plays by Lorca, Pirandello, Strindberg, Bond, Synge and the Prix Goncourt-winning Marie N’Diaye. In cinema he has worked with directors including Jean-Luc Godard and Marguerite Duras. He also participates in art exhibitions, including in a co-exhibition with Juliette Binoche.